What an incredible Summer it is proving to be. 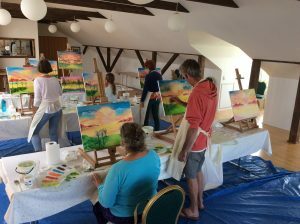 Not only is the weather here on the Isle of Wight amazing at the moment just in time for the forthcoming mini-holiday break for a gentleman visiting next weekend, but the trip to France was great fun as were the painting workshops in Denmark and the year’s not over yet. Lots more on it’s way with workshops/classes and, of course, the Art Student’s exhibition at The Salvation Army Hall on Saturday, 1st October. Loving life.